The revival of the 1972 Stephen Schwartz/Bob Fosse musical Pippin debuted on Broadway last year and won four Tonys and had audiences and critics raving. It was on my list of shows to see this week, but not very high up because of all the new shows coming out this season. It was actually our second or third choice when we got to the TKTS window Saturday night, but after some indecisiveness, it's what we ended up with. Turns out it may have been the best decision we made all week! Pippin is truly spectacular in the best possible way. Many different artforms are combined - circus, Fosse-style dance, a great score, even a sing-along! And the result is a fantastically creative and entertainingly unique evening of entertainment. Pippin is very very loosely based on the historical figures Charlemagne, a King in the Middle Ages, and his first-born son Pippin, a "hunchback" who was passed over for his father's thrown. But in this version, Pippin is a lost young man who's dissatisfied with life and searching for something to make his life meaningful. He tries war, the pleasures of the flesh, and an ordinary life, flitting from one thing to the other, but still feeling empty and unfulfilled. In the original production, the story was told through a performance troupe, but in this version it's a circus, complete with contortionists, trapeze, balancing acts, and acrobatics. It's hugely fun and light-hearted, like a musical/comedy/circus version of Game of Thrones with a touch of Monty Python's Spamalot, where dead men talk and come back to life, and battles are a beautiful dance. In the end, Pippin rejects the circus for his real life, but the circus lives on in our imaginations, always there when we need it. The huge ensemble combines artists of many talents - circus performers, Broadway dancers, and singers. Most of the original cast remains one year later, with three important exceptions. Patina Miller and Andrea Martin, who both won Tonys for their portrayals of the Leading Player and Pippin's grandmother, and Pippin himself. Annie Potts (if you're a fan of 80s sitcoms like I am, you'll remember her from Designing Women) took over the role of the grandmother in January, and she's fantastic, literally singing while hanging upside down from a trapeze (I told her I want to be her when I grow up). 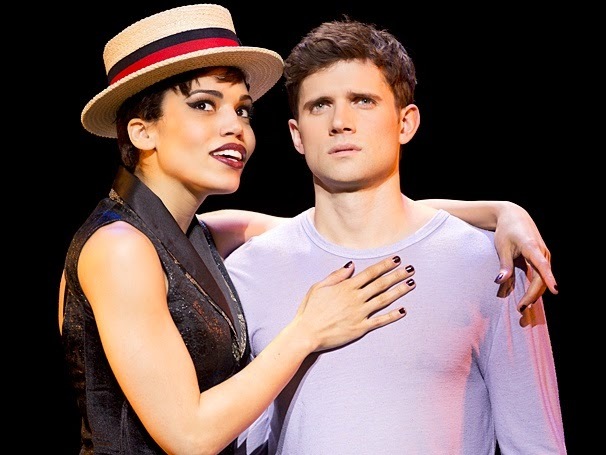 Ciara Renee as the Leading Player and Kyle Dean Massey as Pippin are only in their second week of performances, but you'd never know it. Ciara owns the role and is a commanding, confident, and entertaining ring leader of this crazy circus. Kyle's beautiful voice (I saw him Next to Normal a few years ago) is perfection on these songs, and he has the awkward grace of this boy who becomes a man. Also fantastic are original cast-members Terrence Mann as Pippin's father the King, Charlotte d'Amboise as his stepmother (with some head-spinning quick changes), and Rachel Bay Jones as the charmingly loopy woman who wins Pippin's heart. And then there are a couple dozen gorgeous and talented women and men moving around the stage in all kinds of wonderful ways, and one precocious little boy (Ashton Woerz) who sings a capella alone in the center of a Broadway stage. I really love this score, even though I'd never heard any of the songs before, and will definitely be downloading it. There's Pippin's lovely ballad "Corner of the Sky," the singalong "No Time at All," and the 70s-feeling "Love Song." There are some pretty incredible Fosse-inspired dance numbers, and one jaw-dropping moment after another. It's just good old-fashioned entertainment. Even though I'm a fan of the smaller, more intimate music-theater pieces (like Violet which I saw earlier in the same day), a big beautiful spectacle of a show like Pippin can be so much fun when performed to creative perfection as this one is. It's a revival (directed by Diane Paulus, with her third brilliant revival in a row - see also Hair and Porgy and Bess) that manages to pay tribute to the original and still bring something fresh and new and original to the piece. If you find yourself in NYC, this show is one that cannot be missed. But don't worry, Pippin is coming to us in Minneapolis - the tour will stop at the Orpheum for a week in February next year. Trust me, you'll want to get your tickets to this one as soon as you can!